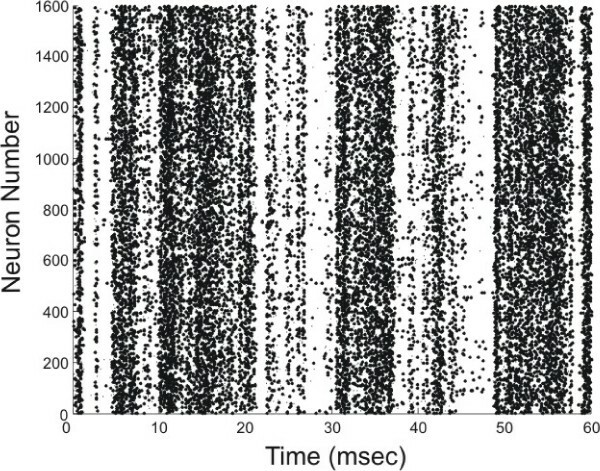 Understanding the spatio-temporal correlations observed in nervous tissue is a major challenge in computational neuroscience. We approach this challenge by modeling the global network state as a single Markov process [1, 2]. Each neuron is modeled as a two (active or inactive) – or three-state (active, inactive, or refractory) random variable, with each neuron's spike probability a function of its input current and internal threshold, updated at time steps dependent upon the current network state. Using the stochastic simulation algorithm , we simulate the network model with excitatory and inhibitory neurons and with random connectivity tuned so that each spike triggers on average one new spike, i.e. in the critical regime. In order to study the model analytically, we recast the model in the language of statistical field theory . The result is a moment-generating functional which permits the calculation of correlation functions and critical exponents. Analytical calculation of the first moment produces a form of the Wilson-Cowan equations . The analytical and simulation results can be compared to those obtained from cortical slice recordings . 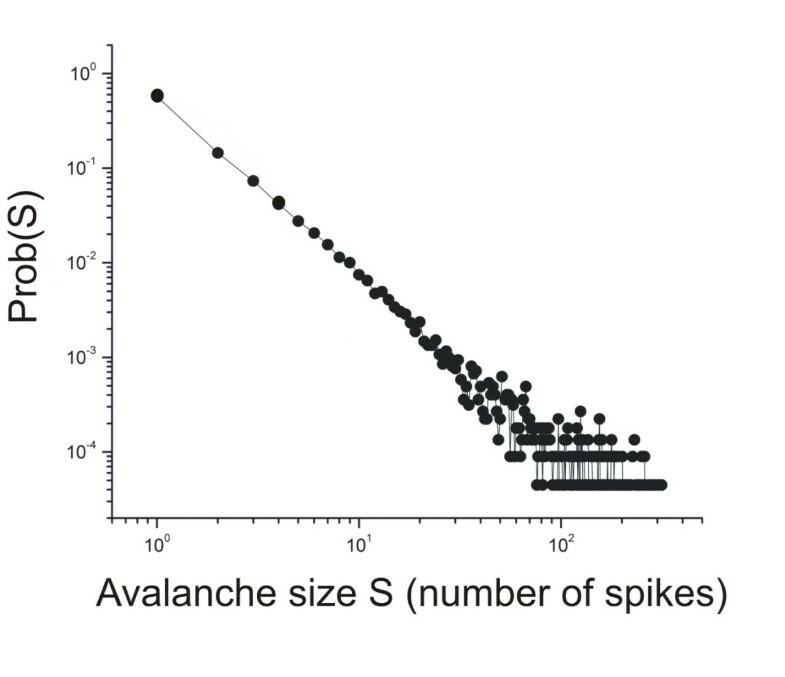 Figure 1 shows that model simulations produce spike trains, as part of highly variable, correlated, network activity resembling the "neuronal avalanches" observed in cortical slice tissue . 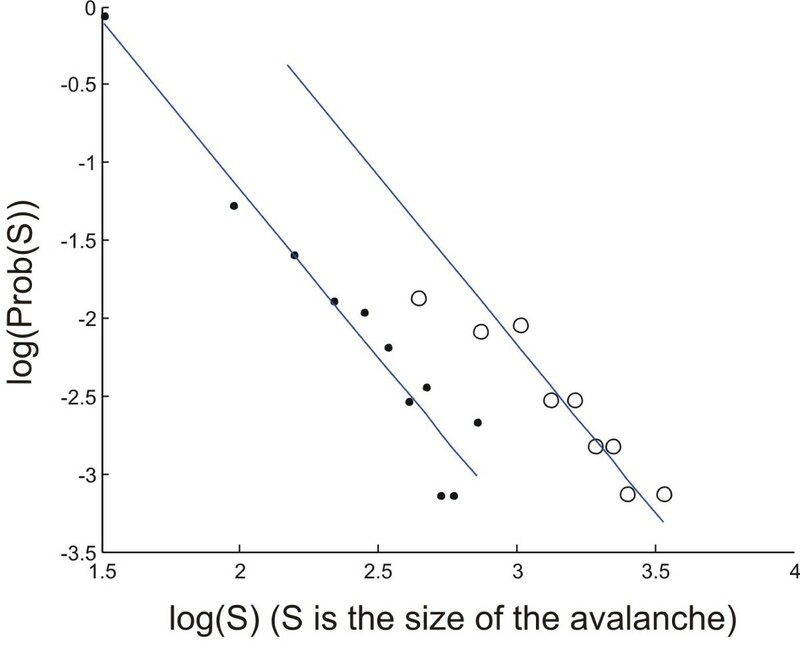 The simulations reveal a power-law distribution of avalanche sizes with a critical exponent of -2.15 when a 900 neuron network is simulated (data set represented by dots in Figure 2) and -2.168 when a 1600 neuron network is simulated (data set represented by circles in Figure 2). These compare well with the critical exponents calculated from unsorted spike data taken from multiunit recordings. Figure 3 shows one such experiment, where the critical exponent was calculated to be -2.14. This work was supported in part by the Falk Foundation and the Linn family. Also, we would like to thank Dr. John Beggs, Dr. Alan Litke, and Aonan Tang for providing the experimental data on critical exponents and Figure 3.